Each snippet of this easy rim trail is stunningly beautiful! With five trailheads to choose from, it’s a breeze to hike just a mile or two, or make the full 11-mile loop. Either way, the Sycamore Rim Hiking Trail is chock-a-block full of jaw-droppingly good views, seasonal waterfalls, wildflowers and more. 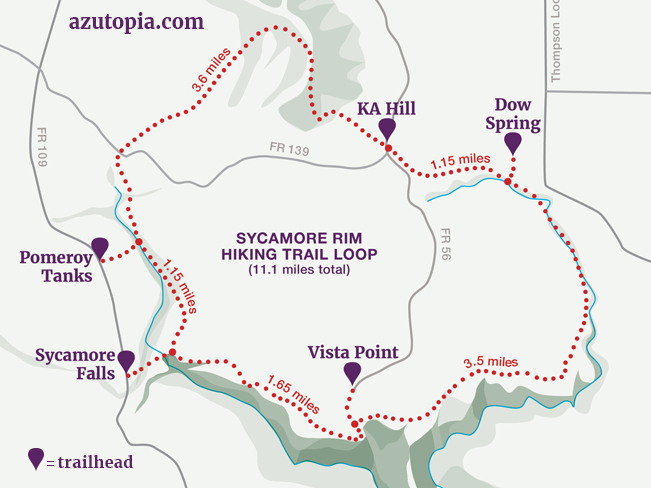 Each of the Sycamore Rim Hiking Trail’s five gorgeous, easily accessible, trailhead sections are described below, starting at the Sycamore Falls Trailhead and moving counterclockwise around the loop. Each bit is uniquely beautiful, with features such as seasonal waterfalls, dramatic ravines, lily pad filled pools or stunning views. 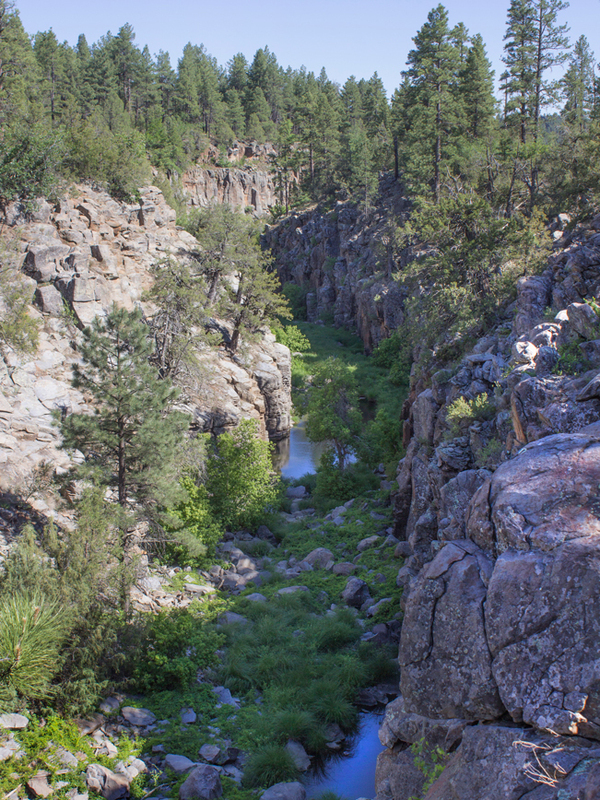 This easy 1.65-mile section follows the northern rim of the canyon and includes one of the hikes main features — Sycamore Falls. 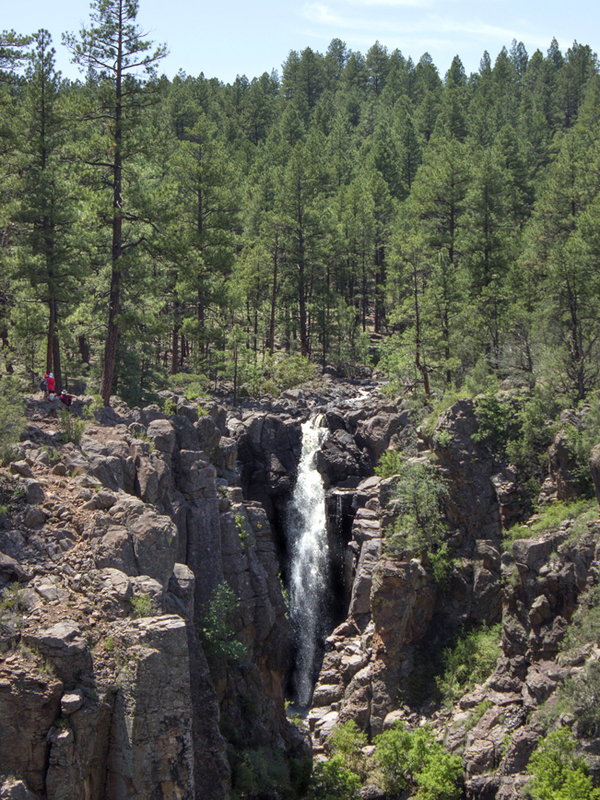 From the Trailhead, a 1/4-mile access trail leads past Golden Falls, to the top of stunning Sycamore Falls. Cross the creek, just above Sycamore Falls, to access the loop trail. Then turn right/east to reach Vista Point. 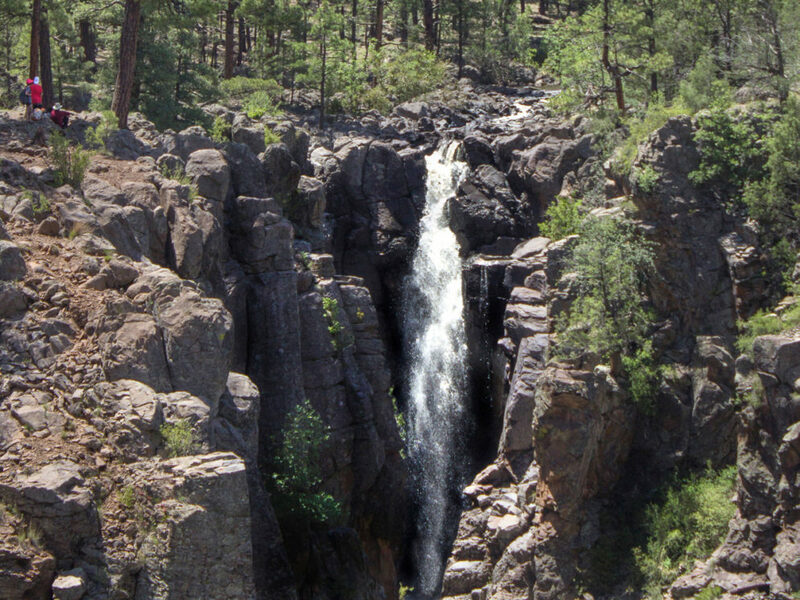 When flowing, during Monsoon Season or after spring melts, almost 70′ high Sycamore Falls is a site to behold! It roars over a deep drop in the rocky canyon to the creek below. By contrast, in early summer and late fall, the flow disappears, leaving the area bone-dry. Turning right onto the Sycamore Rim Hiking Trail loop, the path meanders between Ponderosa Pine Forests and open mesa-top meadows. To the right of the path, the canyon drops off, showing off gorgeous views of the canyon, ravines and southern ranges. This easy 3.5-mile section touts the best view of Sycamore Canyon and passes lovely ponds and marshes. From the Vista Point Trailhead, a 1/4-mile access trail leads south to the Sycamore Rim Hiking Trail Loop. Turn left /east on the loop trail to reach Dow Spring. 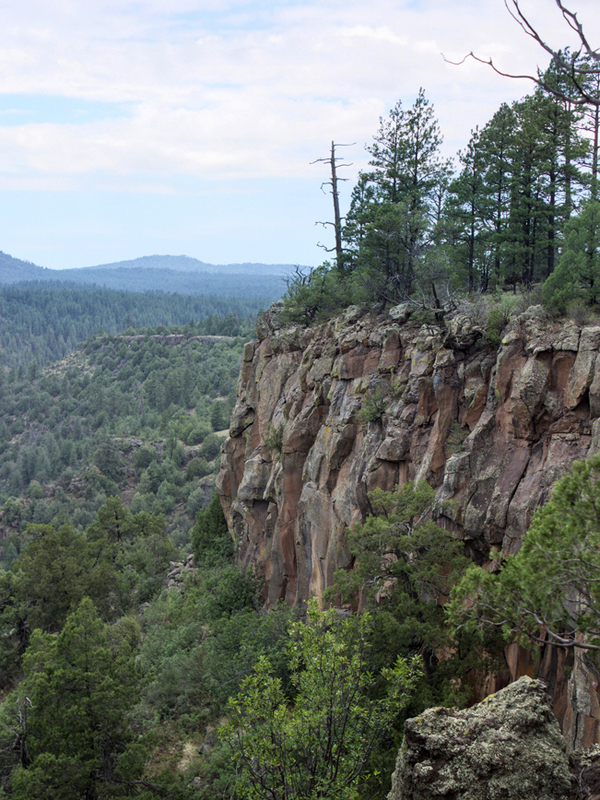 From the Vista Point access, the Sycamore Loop Trail first follows the northern rim of the canyon. Then, after about 2 miles, it curves northwards, hugging the canyon rim above lush Sycamore Creek. As the path nears Dow Spring, it drops to creek level. 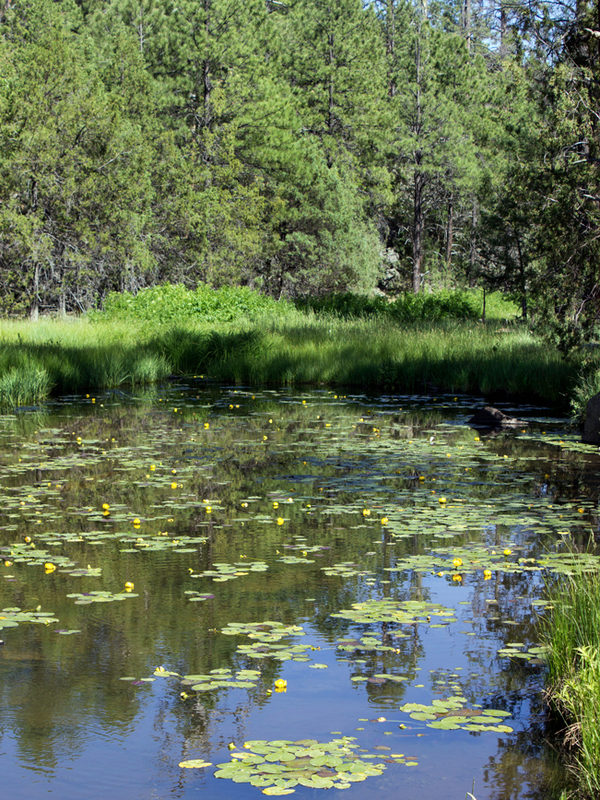 In Spring and Summer the area’s intimate pools are filled with small cascades and yellow-blossomed waterlilies. While frogs, big and small, sing and croak loudly in the reeds. 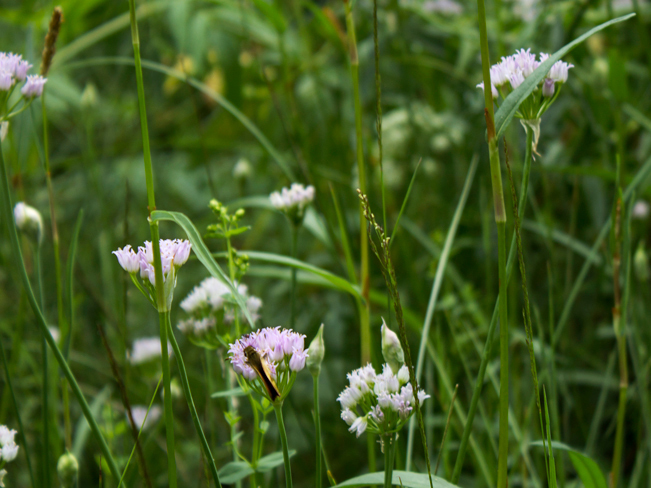 Around the pools, dense marshes of cattails, wildflowers and flitting butterflies frame the creek. 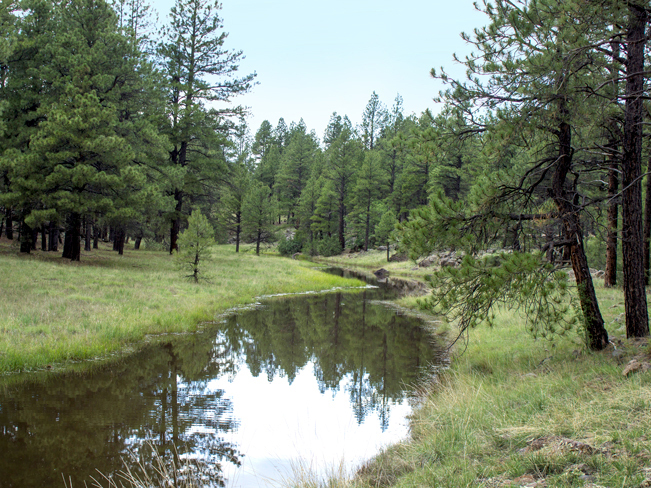 This easy 1.15-mile section crosses the wide, lovely meadows and gentle stream flowing between Dow Spring and KA Hill. From the Dow Springs Trailhead a short access trail heads west to the Sycamore Rim Hiking Trail Loop. Turn right/north to reach the KA Hill Trailhead. 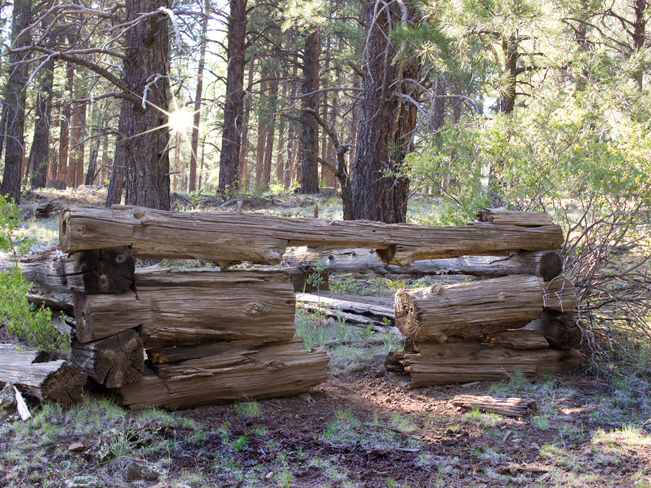 Near the intersection of the Doe Spring Access and Loop Trails, are the remains of a turn-of-the-century logging cabin, and railroad. These are some of the last remnants of a once booming logging trade along historic Overland Road. Continuing right/north, the trail heads down a short hill, then follows a pristine, gently winding stream. Domestic sheep roam this area, leaving funny little cloven tracks across the path and pleasant bell sounds in the distance. This pretty section ends at the KA Hill Trailhead on Forest Road 56. This 3.6-mile long section starts off with a 1.25-mile, moderate, 500′ ascent to the top of KA Hill. From the trailhead, cross Forest Road 59 and head west to reach Pomeroy Tanks. For those planning to tackle the full 11-mile loop, this is a great starting point. The trailhead parking area sits right on the trail, and the only moderately steep portion of the loop can be knocked off first! 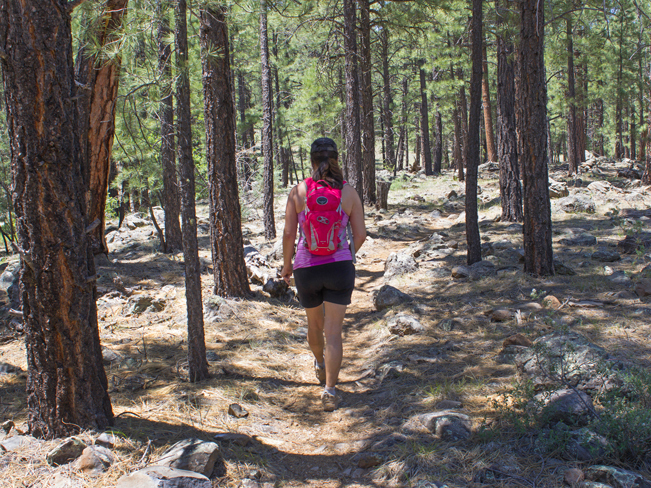 The moderate climb up KA Hill is shaded by tall Ponderosa Pines, followed by Oak and Aspen as the trail ascends. From the hilltop, expansive views spread out between the trees. 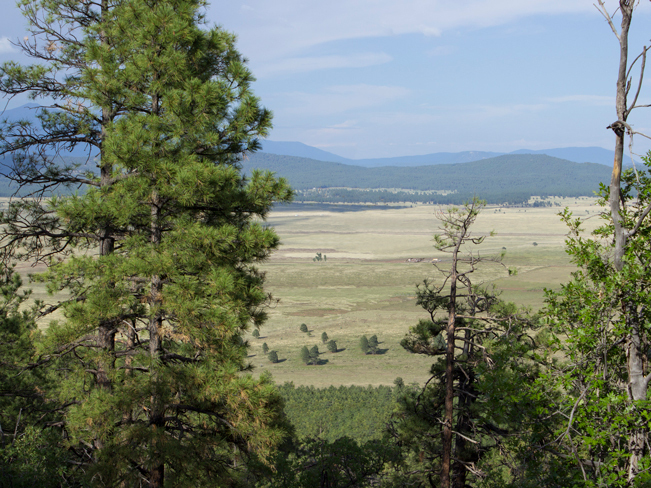 Garfield Plain, Kendrick Mountain and Humphreys Peak are visible to the east. While Williams Mountain can be seen to the west. From KA peak, the next mile is a super easy downhill. The trail then flattens out, and meanders through an open expanses of pine, before crossing Forest Road 139. From here to Pomeroy Tanks, the trail is a little harder to follow. It first crosses a wide stoney field marked with strategically placed (but sometimes hard to see) cairns. Then it meanders alongside a gentle stream towards Pomeroy Tanks. The tanks are gorgeous when full! Small waterfalls course around dramatic stone cliffs. While tranquil pools offer sanctuary to colorful dragonflies and wildflowers. Cross the creek to continue around the loop. 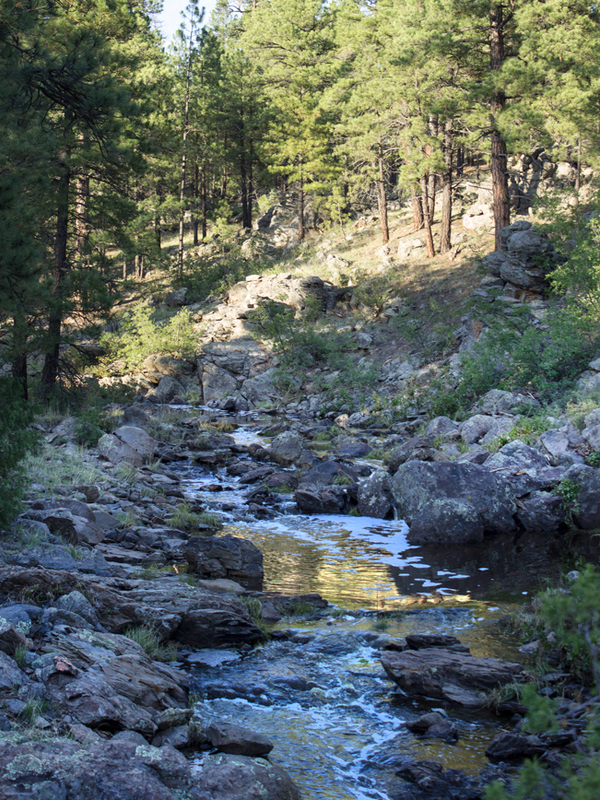 This easy 1.15-mile section follows a lovely, seasonal, forest-lined stream. From the Pomeroy Tanks Trailhead a 1/2-mile access trail heads west to the Sycamore Rim Hiking Trail Loop. Turn right/east to reach Sycamore Falls. This trail section crosses the stream multiple times as it wanders southeast towards Sycamore Falls. During snow melts and Monsoon Season there are tons of small babbling cascades and grassy marshes to dip your toes into. 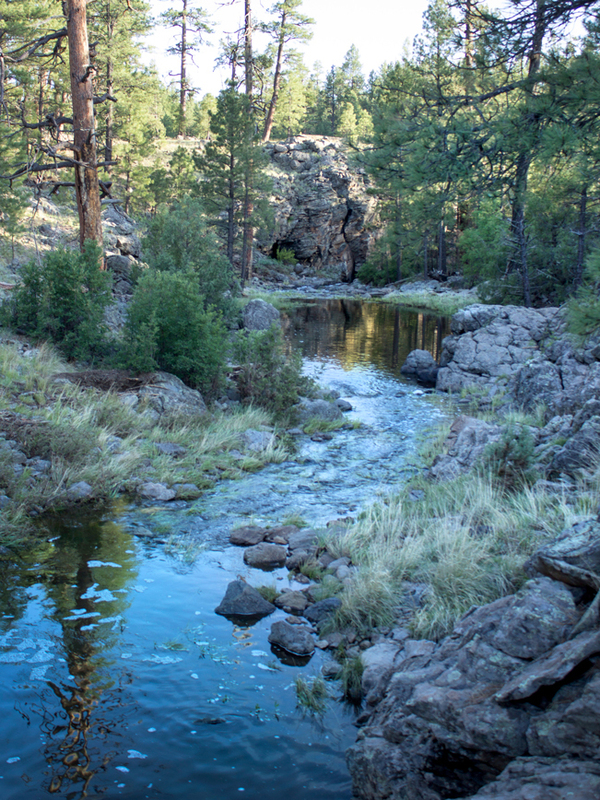 Gorgeous, 21-mile long, Sycamore Canyon winds south through three national forests: Coconino, Kaibab and Prescott. 1. Sycamore Falls Trailhead – Turn right /north onto FR 527 / Thomas Loop Road, and continue 0.75 miles to Forest Road 141. Turn left /west and drive 3 miles to Forest Road 109. Turn left / south onto Forest Road 109 and continue for 3.35 miles to the trailhead parking lot. Located on the left/north side of the FR 109. 2. Vista Point Trailhead – Turn right /north onto FR 527 / Thomas Loop Road, and continue 0.75 miles to Forest Road 141. Turn left /east and drive 1.75 miles to Forest Road 56. Turn left / south onto Forest Road 56 and continue for 3.85 miles to the trailhead parking lot. Located on the left/east side of the FR 56. 3. Dow Springs Trailhead – Turn left /south onto FR 527 / Thomas Loop Road, and continue another 0.5 miles to the trailhead parking lot on the right/west side of the FR 527. 4. KA Hill Trailhead – Turn right /north onto FR 527 / Thomas Loop Road, and continue 0.75 miles to Forest Road 141. Turn left/east and drive 1.75 miles to Forest Road 56. Turn left/south onto Forest Road 56 and continue for 1.8 miles to the trailhead parking lot. Located on the left/east side of the FR 56. 5. Pomeroy Tanks Trailhead – Turn right /north onto FR 527 / Thomas Loop Road, and continue 0.75 miles to Forest Road 141. Turn left/east and drive 3 miles to Forest Road 109. Turn left/south onto Forest Road 109 and continue for 2.4 miles to the trailhead parking lot. Located on the left/east side of the FR 109. These forest roads are well-graded gravel, and are suitable for passenger cars.